Reigning over Montreal*s vibrant cultural center - Fairmont The Queen Elizabeth sets the standard for service and hospitality in this remarkable city. 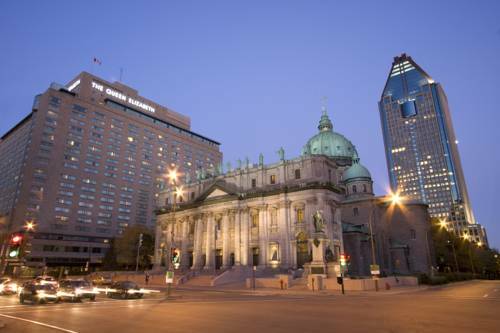 Recognized in Conde Nast Traveler* 2002 Gold List - the hotel sits near famous landmarks such as Place des Arts - Dominion Square and Place Bonaventure - thereby providing the perfect base to explore this cosmopolitan metropolis. Unwind afterwards in our modern Health Club or sip off a drink in the famed Les Voyageurs Lounge. A remarkable hotel in a remarkable city - Fairmont The Queen Elizabeth has all the elements to tempt - delight and cater to every need. Dine in the warm ambiance of our bistro-style restaurant Le Montrealais. Let our modern Health Club help refresh and invigorate you with its indoor pool - steam room - whirlpool and state-of-the-art equipment. Catering to the sophisticated business and leisure traveler - Fairmont The Queen Elizabeth addresses your special needs with superb and dedicated service. Fairmont The Queen Elizabeth has 982 gracious guest rooms and suites and specialty rooms - offering the ultimate in luxury for business and leisure travelers. The hotel also offers Fairmont Gold - our luxurious *hotel within a hotel* which offers an exceptional level of personalized service and luxury found only at a few select hotels and resorts in the world. Afternoon Tea: Afternoon Tea and Kaffee Klatsch - Le Montrealais Bistro Bar 26.00 per person plus taxes and gratuities. CASINO DE MONTREALThe Casino has 120 gaming tables, including Poker Texas Hold em and over 3000 slot machines on five floors of sheer entertainment. Open 24 hours a day free parking and coat check. CHINATOWNMontreal*s small but busy Chinatown is the only place to go for authentic Chinese food lovers. Guests will also find great gift ideas including beautiful kimonos- crafts and china. DINNER TOURS-BATEAU MOUCHEExperience the most breathtaking encounter of sun river and city. Take it all in from the loveliest floating terrace in Montreal while enjoying a breeze or from our air-conditioned atrium. Come discover at night the gourmet dinner cruises. L ORATOIRE SAINT-JOSEPH SAINT-JOSEPHS ORATORYSt. Joseph*s Oratory is one of the most important spiritual centres in the world and the largest sanctuary dedicated to Saint Joseph. Founded by Brother Andre (1845-1937)- a member of the religious order of the Holy Cross. LA RONDE-SIX FLAGS - AMUSEMENT PARKLa Ronde first opened in 1967 as part of Expo 67- a worlds fair of stupendous proportions. There are currently 37 rides- featuring the new star attraction to come - Le Demon- an intense and impressive ride for a high-adrenalin daring experience. LINTERNATIONAL DES FEUX LOTO-QUEBECEvery summer eight pyromusical fireworks shows are presented in Montreal- the closing finale is one of largest such events in the world. International competitors representing their respective countries fight for prizes. MONT ROYALMont Royal is a very special part of Montreal*s heritage- being one of the largest and most important green spaces in the metropolitan region. It features look-out points- bicycle paths- picnic sites- cross-country ski trails- walking trails. MUSEE DES BEAUX-ARTS/MUSEUM OF FINE ARTSOver the past 140 years- the Montreal Museum of Fine Arts has assembled one of North America*s finest encyclopedic collections- totalling over 30000 objects. It*s permanent collection features Canadian Art- Contemporary Art- Inuit + Amerindian Art. NOTRE-DAME BASILICAThe Notre-Dame Basilica is a masterpiece of NeoGothic Architecture-dating back to 1829. The building is well known for the richness of its interior decoration. Singer Celine Dion said her wedding vows in this church in 1994. Guided Tours available. OLD MONTREAL VIEUX MONTREALDiscover its unique architecture- museums- shops- restaurants- outdoor cafes and all the activities at the Old Port. OLYMPIC STADIUMBuilt to host the 1976 Olympic Games, the Olympic Park is a tourist location of international calibre. Ride the cable car up to the Observatory at the top of the worlds tallest inclined tower. Enjoy a breathtaking view of Montreal. SHOPPING-STE CATHERINE STLocated 2 blocks north of the hotel - Ste. Catherine*s Street is one of the best known streets in Montreal. Situated in the hub of the city it is accessible by the underground passage which is directly connected to the hotel. UNDERGROUND CITYDirectly connected to the hotel the underground city is a network of over 2000 stores- restaurants and theatres. The city*s subway stations connect the underground city to the outside world.